Gear up and enter the ESS Meridian once again for an epic battle against the deadliest mutated creatures ever! BadFly Interactive's Dead Effect 2 hack (online, offline) is a shooter fan's dream game, and with our unlimited money and gold version, there is no stopping you. Grab your gear and advanced weaponry, develop your character, and fight for your life! 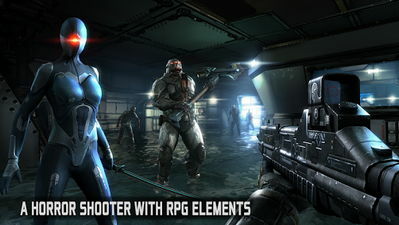 The game is a critically-acclaimed action-packed sci-fi shooter with RPG elements. Discover an exciting storyline as you progress through the game and develop any of the 3 personas you choose. You've got at your disposal more than a 100 upgradable body implants and gear sets, plus over 40 upgradable weapons to train and use in combat. Now that's RPG character development! - X1 exclusive features: HDR, Depth of Field, high quality textures, bloom effects ??? New mods: Unlimitted Stamina, Power, Ammo, Credits, Crystals, Unlock Points, Upgrade Points. Install Apk according to your device, then Extract OBB into internal storage Android/Obb , and then run the game to play. Note: there maybe some FC on some devices. I tried it on my Samsung S7 (Global) - Mali but it kept on looping in the Google Play log in endlessly.